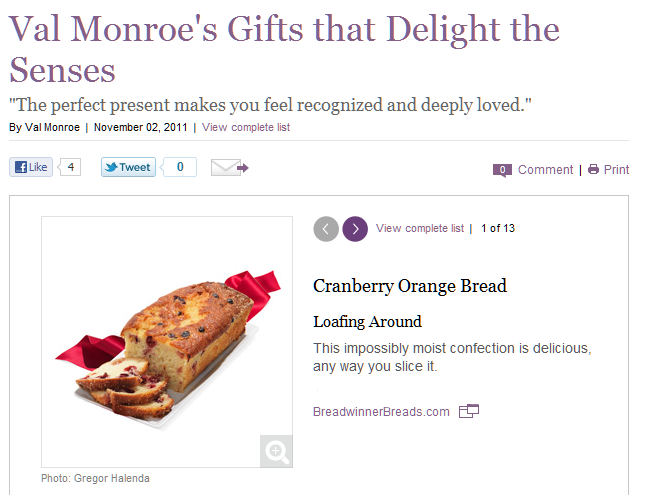 Breadwinner Breads' "Frankly, My Dear, I Don't Give a Cran" cranberry-orange bread is featured in O Magazine's Holiday Gift Guide this year! That sweet, delicious, and proudly not low-calorie bread is one of the Holiday Gift Guide's "gifts that delight the senses." We're thrilled to be part of the "favorite things" chosen for the magazine - we had to beat out some tough competition with our tender and tasty homemade bread, but we did it. To celebrate, we've given O Magazine a special coupon code that's good for a discount on not only our cranberry-orange bread, but all four of the remarkable sweet homemade breads we're featuring this season. You can see the online feature piece here. But, if you really want to experience the glory of O Magazine's holiday gift guide and see a stunning picture of the bread you should be eating (and giving) this season, pick up a copy of the December issue. Peruse the holiday gift guide, get the discount code, come on back and stock up on all the tasty bread you'll need to make the holiday memorable for you and yours. Make it a Breadwinner Breads kind of holiday. We're baking up more cranberry-orange bread just for you.